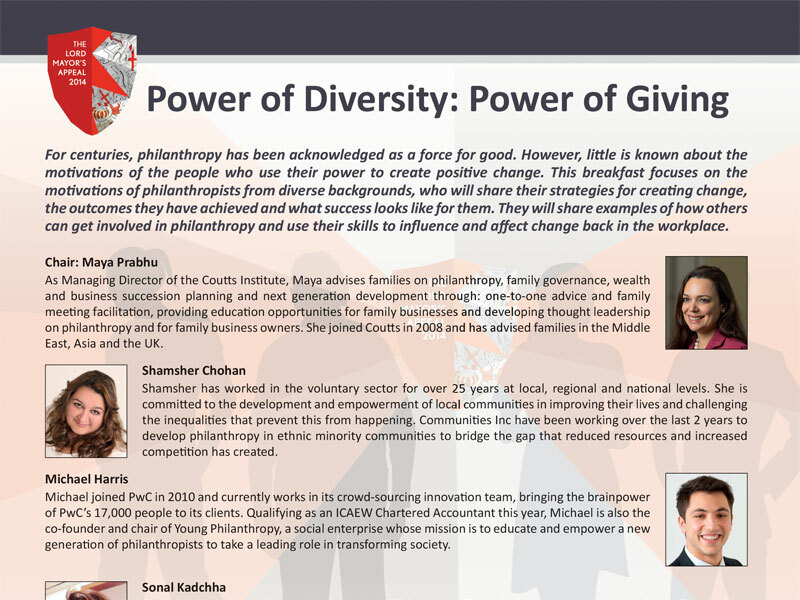 Shamsher Chohan of Communities Inc was a panel member on the Power of Diversity: Power of Giving Breakfasts on the 2nd May 2014, organised in support of the London Lord Mayors Appeal 2014. The session, hosted by Coutts, provided an opportunity to discuss how philanthropy can be diversified and made more relevant to people working in the City. The discussion acknowledged that philanthropy is a wide field with people taking different approaches to how they organise their ‘giving’. For some it is a broad approach to affect change and influence growth and development in communities but for others it was an opportunity to focus their efforts in particular areas, such as the work done by the Elton John Foundation around HIV or ROSA which supports work that benefits women. There is very little research on the patterns of giving in black communities but we do know that as recipients they do not benefit as much as they should do. Research shows that giving from the top 20 trusts and foundations in the country amounted to 2% to projects benefitting black communities. Shamsher says “this is the reason why we are focussed on black philanthropy, there is a sense that we need to do something within our own communities to help ourselves, we know the mainstream is not going to look after our needs”.